The Moon separates from Saturn & doth apply unto the Conjunction of Mercury Significatrix of the Querent; an argument after much expectation & longing, the Woman should heare of him in 2 or 3 dayes, because the distance of Moon from the body of Mercury is about 1 degree and no more, and the Sign movable, [so she did.] But as Mercury is in a movable Signe, and Moon is corrupted by him and Saturn, the report she heard of her Husband was false [for she heard he was in Town,] but it was not so. 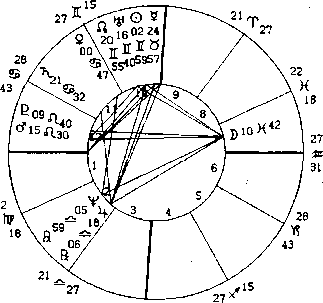 Considering that Mercury and Jupiter did hasten to a Conjunction in Gemini, Mercury being therein very potent, and that this Conjunction was to be the 5th day of May following; I judged from thence that about that time she would have certaine newes of her Husband, if happily he came not then home. The second week in May the Woman did heare certaine newes from her Husband, but he came not home till the second week in July, he had been severall Voyages in the West parts, was taken prisoner by the Kings Forces, and at time of the Question asked, was at Barnstable, &c.
all manner of QUESTIONS. CHAP. LXXII.